Correctional officers in Oklahoma work in a variety of local, federal, and state incarceration and administration facilities. While a majority of the state prisons are run by state agency, there is a mounting trend toward the hire of third-party contractors to manage and oversee all aspects of the facility, as is done with Cimarron Correctional Facility and Davis Correctional Facility. Oklahoma prison facilities have a range of incarceration options available - some, like the Howard McLeod Correctional Center and Jackie Brannon Correctional Center contain a secured space for long-term and violent offenders. Others, like Oklahoma City Community Corrections Center focus on minimum-security units for inmates. Community work centers focus on supporting inmates who have clearance for outside jobs and community support programs. Regardless, Oklahoma's Department of Corrections maintains a safe, professional environment to benefit staff, inmates, and surrounding communities. State need, coupled with federal facilities (Federal Correctional Institution, El Reno) and an extensive county jail system means that staffing needs over the next 10 years are poised to grow at a steady rate (BLS.gov) - in Oklahoma this means that there will be approximately 200 new positions created for frontline correctional officers, as well as gaps to be filled in existing staff deployment as senior corrections officers retire, change jobs, or advance their careers. Read more to discover more information about opportunities in corrections below. Bacone College ranks 1st in our latest rankings with 16 students completing programs in criminal justice out of a total 288 graduates from the 2012-2013 school year. 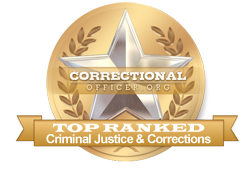 Cameron University ranks 2nd in our rankings with 92 students completing programs in corrections out of a total 1,746 graduates in the 2012-2013 school year. Redlands Community College ranks 3rd in our rankings with thirty-two students completing programs in criminal justice out of a total 702 graduates from the 2012-2013 school year. Oklahoma State University-Oklahoma City ranks 4th in our rankings with eighty-five students completing programs in criminal justice out of a total 1,912 graduates from the 2012-2013 school year. "Tulsa Tech's Criminal Justice program provides relevant and targeted training to equip students with the skills necessary for future success in law enforcement. Our students are trained in state-of-the-art facilities by instructors who have practical experience in the field. In addition, our instructors work closely with the law enforcement community to provide meaningful work-based experiences and post-training employment opportunities for our students." Northeastern State University ranks 6th in our latest rankings with 132 students graduating from programs in law enforcement administration out of a total 3,712 students in the 2012-2013 school year. Western Oklahoma State College ranks 7th in our latest rankings with 19 students graduating from programs in criminal justice out of a total 552 students. Eastern Oklahoma State College ranks 8th in our latest rankings with 20 students graduating from programs in security and loss prevention services out of a total 630 students. Located across multiple campuses in the state of Oklahoma, Langston University is a public 4-year university offering a full complement of degree and certificate options to its students. Founded in 1897, Langston's most recent program offerings include a comprehensive focus on criminal justice, which students may pursue at the certificate, associate's or bachelor's degree levels, depending on their interests and career goals. Seminole State College ranks 10th in our rankings with sixteen students graduating from programs in law enforcement administration out of a total 640 graduates from the 2012-2013 school year. Those candidates who prove to be the most qualified after the second hiring phase will be contacted for enrollment in the state's corrections officer training academy. The training program is to prepare candidates for a variety of on-the-job situations by equipping them with practical skills. Successful completion of this final phase in the hiring process will allow candidates to graduate as certified corrections officers. The state Department of Corrections in Oklahoma encourages citizens who are pursuing careers in state service to become front-line correctional officers. At this time, the median income for correctional officers throughout Oklahoma is lower at $30,700 than the national median income at $39,800, but according to occupational data for the state of Oklahoma, available at http://www.careerinfonet.org/occ_rep.asp?next=occ_rep&Level=&optstatus=011000000&jobfam=33&id=1&nodeid=2&soccode=333012&menuMode=&stfips=40&x=68&y=15 and published by CareerInfoNet.org, state trends are predicted to experience an 11% growth curve from now until 2022 as compared to the national growth rate of 5%. This predicted growth pattern translates into 230 new and existing openings annually over the next decade. The table below lists career information collected by the Bureau of Labor Statistics for correctional officers in Oklahoma. The table is sorted by total employment, with the largest metropolitan areas listed first.